The Second Annual Whip City Brewfest features unlimited beer tastings from local craft breweries, vendors, food trucks, live music, raffles, and more. All proceeds benefit Amelia Park Children's Museum, to help operate and maintain our facilities in Westfield and continue to bring fresh exhibits and programs to the young children of our community. Special thanks and recognition go out to our venue host, The Westfield News Group! 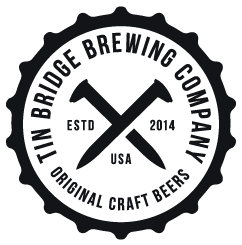 and our headline sponsor, Tin Bridge Brewing Co.! and to all our other sponsors and supporters listed below. TICKETS are available in advance on Eventbrite: https://www.eventbrite.com/e/2nd-annual-whip-city-brewfest-tickets-53277130331. General Admission tickets are $35 in advance ($45 at the door) for admission from 1:00 - 5:00 p.m. Special VIP early-admission tickets are $50, available only in advance. General Admission tickets will also be sold at the door, as capacity permits. See Eventbrite for additional details. VIP TICKET HOLDERS will be admitted one hour early, for much smaller crowds, better access to brewery vendors, and exclusive VIP-only goodie bag. All attendees will receive a commemorative tasting glass (first 500), and unlimited tastings from the breweries participating. This is a 21+ event. All entrants, including designated drivers, must provide a valid ID at the door. Nobody under 21 will be admitted. Yes! We would like to register as a Participating Brewery in the Whip City Brewfest, a charitable event supporting the Amelia Park Children’s Museum. For this event, Breweries generously agree to donate their beer for tastings in support of the Brewfest and the Museum. We encourage Breweries to send a representative to serve and promote their products, but if unable to do so, we will provide a volunteer to pour your beer using your equipment. (We anticipate 500+ attendees, based on previous Brewfest experience). Please complete the form below or download here. Yes! We would like to register as a Vendor at the Whip City Brewfest, a charitable event supporting the Amelia Park Children’s Museum. Vendors are provided one six-foot table outside the tasting tent for a pre-paid fee of $50 payable to Amelia Park Children’s Museum. Vendors are encouraged to donate a portion of their proceeds to the Museum. Space is limited. First come, first served. Each vendor participates at his/her own risk. The Amelia Park Children’s Museum, its officers, its employees, and its volunteers shall not be held liable for any loss, damage or personal injury incurred while attending the Whip City BrewFest. I agree to comply with all requirements and regulations of the event. You can support Amelia Park Children’s Museum’s fundraiser – the Second Annual Whip City Brewfest on June 1, 2019 - in many ways. Please contact us or return this form with you Sponsorship choice. Your contribution is tax deductible (APCM is a 501(c)(3) charity, Tax ID 04-3271875). Headline Sponsor $1000: Recognition on all promotional materials, website, Facebook page and all communications as a primary, headline sponsor. Two (2) large banners at the event and two (2) lawn signs at the event. Two (2) free tickets. Speaking time at the event. Tent Sponsor $750: Sponsor the main tasting tent housing our craft brewers. Recognition on all promotional materials, website, Facebook page. One (1) banner and two (2) lawn signs at the event. Stage Sponsor $500: Sponsor the stage and tent provided for our live musical acts that will be playing throughout the Brewfest. Recognition on all promotional materials, website, Facebook page, and one (1) banner (near the stage) at the event. Ice Sponsor $250: Help keep the brews cool! Recognition on all promotional materials, website, Facebook page. Two (2) lawn signs at the event. Sign Sponsor $100: Recognition for your support with one lawn sign at the event, and on the Brewfest website and Facebook page. Supporter $75: Recognition for your support on the Brewfest website. Venue: Westfield New Group (Outdoors), 62 School Street, Westfield MA. Please enter the staging area from Central Street. Vendors: $50. Contact us to discuss in-kind options. One six-foot table will be provided per Brewery/Vendor. Table placement will be determined at the discretion of the Brewfest Committee. BYO chair. Setup will take place from 10:00 to 11:00. All Brewers and Vendors must be on site by 11:00 at the latest. Setup staging area is behind the Westfield News Group building, off Central Street. Power is not available on site, with limited exceptions. Ice will be provided to keep the beer cold, while supplies last. Breweries must provide their own cold plate / jockey box equipment. Each table should be staffed for the full event (12:00 to 5:00). Breweries seeking a volunteer to serve their beer, with their equipment, should contact us at least two weeks in advance. Brewers will be given space under the main tent. Other vendors will be provided a table outside the tent. Vendors may provide their own tent/table set-up. All Vendors are reminded that the weather is unpredictable, and you should plan accordingly in case of rain or cool weather. Brewers and Vendors agree to provide at least two weeks’ notice to the Brewfest Committee in the event of canceling their participation in the Brewfest. Questions? Interested in volunteering? Just want to say hello? Fill out the form below and we'll get back to you as soon as we can!